Son of A. Eaglen and Dulcie Eaglen, of Saham Toney, Norfolk; husband of V. Eaglen, of Holme Hale, Norfolk. David Moran, whose mother was half sister to Irvine, has provided us with some useful family history information. If you would like access to this document please email the website administrators. Irvine' s father, Charles, was the first administrator of the Royal Perth Hospital. Irvine's family home address was 'Waverley', Grant Street, Cottesloe, Perth. We are advised that the house still stands today. In 1938 Irvine and his brother, Vernon, were living and studying in England, staying with a relative. SEE CREWS AND LOSSES for Wellington (model unknown) L7840 BU-? Buried in LANGTON MATRAVERS CHURCH CEMETERY. Reference : North part under west boundary wall. Son of Ernest Edmund and Amelia Fanny Eastment, of Langton Matravers. SEE CREWS AND LOSSES for Wellington Mark I C R1380 BU-? Named on the following Memorial : RUNNYMEDE MEMORIAL Panel 61. Named on the following Memorial : RUNNYMEDE MEMORIAL Panel 42. Son of Hubert John and Charlotte Mary Ebsworth, of Billericay, Essex. Buried in BERGEN-OP-ZOOM WAR CEMETERY. Reference : Coll Grave 32. C. 2. Son of W. H. and Marion Eddison; husband of Jill Eddison. London Gazette Issue 34369 published on the 9 February 1937. London Gazette Issue 34996 published on the 19 November 1940. Past student of St Joseph's College Melbourne, Australia. DFC listed in the London Gazette Issue 36480 published on the 18 April 1944. 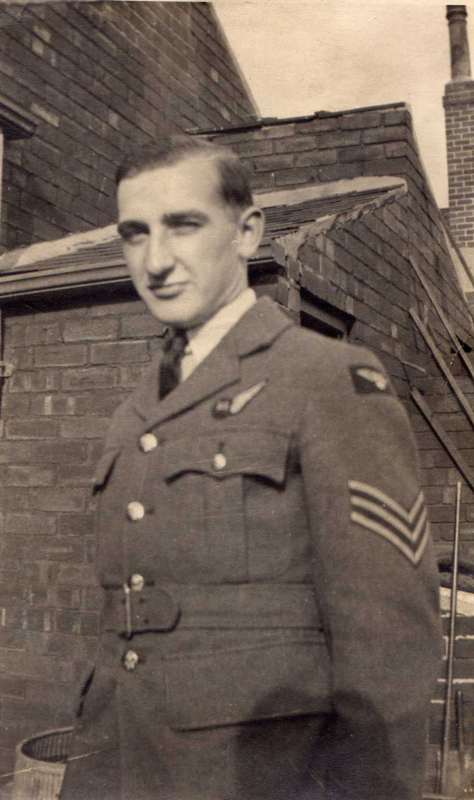 Sgt Edington was flying as part of a crew in 214 Squadron from November 1941 until January 1942. On 19 January 1942 he was posted 99 Squadron. On 23 February 1942 he was posted to Portreath from Waterbeach. 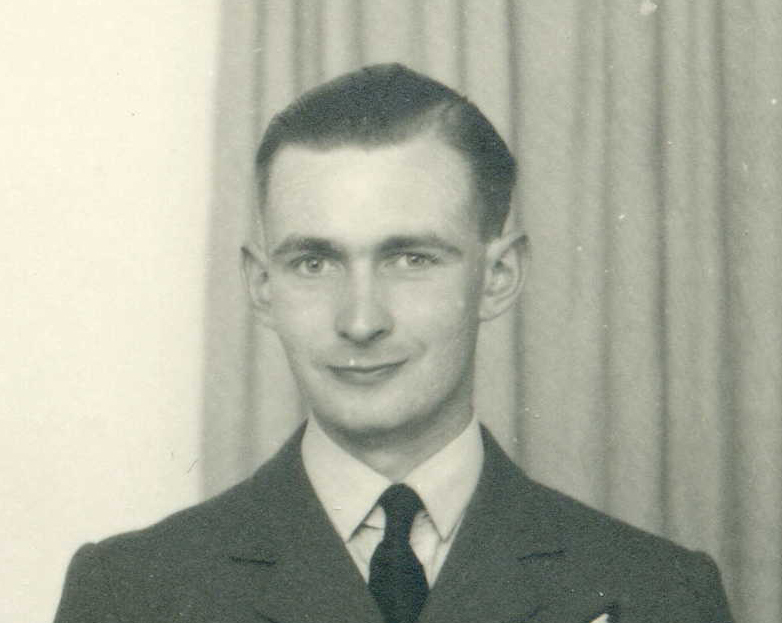 On 26 February 1942 he was posted from Portreath direct to Malta, en-rote to to ME fro 99 Squadron in India, being seconded to 215 Squadron, on arrival, until rejoining 99 Squadron in Oct 1942 until at least 1943. Buried in REICHSWALD FOREST WAR CEMETERY. Reference : 3. C. 15. Son of Joseph Michael and Annie Maria Egan, of Victoria Park, Western Australia. Buried in EINDHOVEN (WOENSEL) GENERAL CEMETERY. Reference : Plot JJ. Coll. grave 54-56. Buried in GRONINGEN (ESSERVELD) GENERAL CEMETERY. Reference : Plot RP. Row Class 2. Coll. grave 25. Son of Alexander and Drusilla Elder, of Westminster, London. Alexander Graeme Elder went to preparatory school at Brambletye near East Grinstead in Sussex and then on to St Paul's Boys School in London. 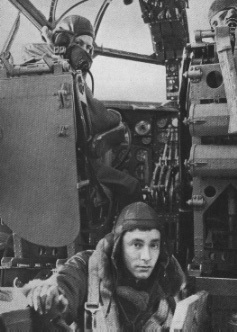 He joined the RAF and became a pilot on a Wellington with 214 Squadron. Named on the following Memorial : Runnymede Memorial Panel 103. Sgt M (Jinx) Elelman, Rear gunner. He survived the war but died some years ago. His widow Mrs H Elelman was an early member of the Squadron Association. Sheridan recognises Roy in the Squadron photograph 1942 in Photo Album 4. "My Dad is in the first row, where the crease is under the (1942 photograph) Stirling cockpit, he is just to the right of the crease, the shorter man sitting my Dad was about 5' 10"
Roy flew in the 7th Squadron before joining 214 Squadron. 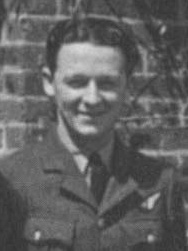 Roy received all of the following Honours DFC RAF, mentioned in despatches, Croix de Guerre, two one Palms one with Silver Star, DFC USAAF, Air Medal, other campaign medals. Promoted to Major and was Operations Officer. Named on the following Memorial : RUNNYMEDE MEMORIAL Panel 43. Son of Joe and Mary Ellen Else, of Norton Lees, Derbyshire. 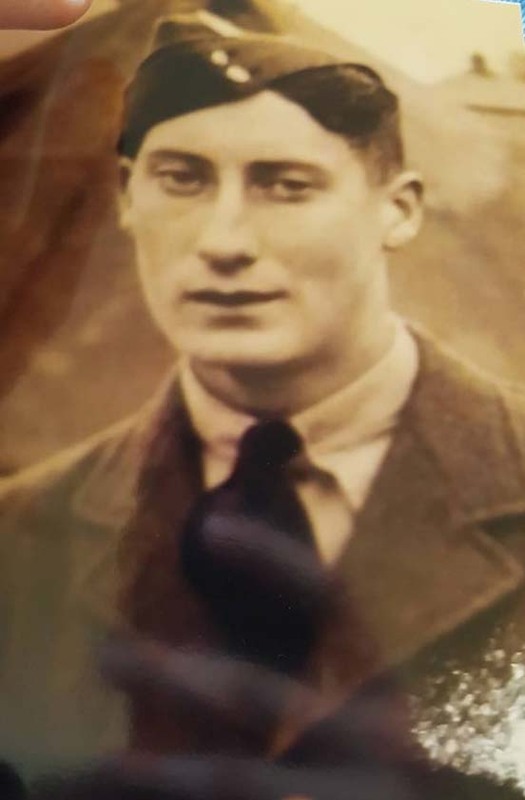 "City Raid Hero is Now Reported Missing"
A Sheffield Airman who did heroic work when home on raids, has now been officially reported missing while taking part in air operations over Germany. He is Sergeant Wireless-Operator-Air-Gunner Jospeh Shield Else, aged 20, of 92 Balfour Road, Darnall, Sheffield. While home on leave last December he put on old clothes and went out with his brother, a member of the Sheffield A.F.S., to fight fires. Major J.W.Merryweather, then Commandant of the Sheffield A.F.S., wrote a letter to his commanding officer complimenting Else on his 'heroic behaviour'. Educated at Woodhouse Grammar School, Else worked in the research laboratories at Thomas Firth and John Brown Ltd., and was called up as a Reservist at the outbreak of war. SEE CREWS AND LOSSES for Wellington Mark I C Z1143 BU-? Buried in VRIEZENVEEN GENERAL CEMETERY. Reference : Coll. grave 1-6. Son of Frederick and Sarah Emms; husband of Phyllis Mary Emms, of Welling, Kent. Son of William Henry and Gertrude Adela Erby, of Brighton, Sussex. See Photo Album 3 for newsclipping on Sqn/Ldr Ercolani and the loss of his Wellington. He received his DSO for this mission. 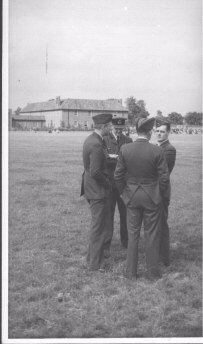 As a result of this mission his father (of Ercol Furniture fame) presented the Squadron with a carved, wooden Squadron crest, which still exists and is put on display at the annual reunions. 29 November 1942 - Ferry flight across Africa to Cairo, en-route for India. Now listed as Squadron Leader. Ercolani was well known to Fg/Off Bill Esplen and his wife as both he and his wife were billeted at the same farm as them. Lucian Brett, DSO DFC. Peacefully on 13th February 2010, aged 92 after a short illness. Dearly loved father of Jane, grandfather of Charlotte and James and great grandfather of Seba and Rosa. The Funeral Service was held at All Saints Parish Church, High Wycombe on Tuesday, 23rd February at 2.30 pm followed by a private family burial. SEE CREWS AND LOSSES for Wellington Mark I C R1784 BU-? Buried in BERLIN 1939-1945 WAR CEMETERY. Reference : 4. A. 11. Son of William and Lucie Esplen; husband of Kathleen Eleanor Esplen, of Kingston Hill, Surrey. 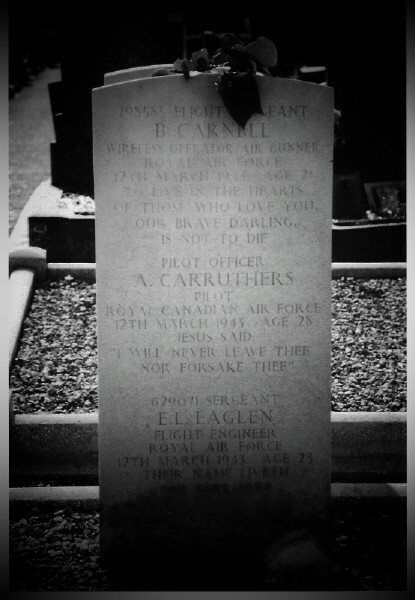 Bill Esplen was a popular and well-liked member of No 214 Sqn at Stradishall. His trade was a Wireless Operator/Air-Gunner. 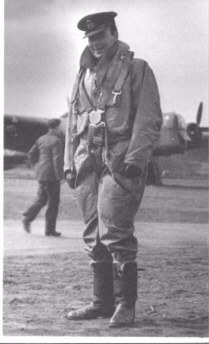 In August 1941 South African Wg Cdr G L Cruickshanks DFC (ex-No.9 Squadron) took over command of 214 on the completion of W/C RB “Duck” Jordan’s time as CO. The squadron was active over many targets over this period and on 7/8 September detailed 11 aircraft; part of a force of 197 aircraft including 103 Wellingtons; to attack Berlin. 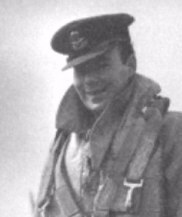 Squadron Commanders were allowed to fly a limited number of “ops” and the new CO decided to make his first trip with 214 but instead of flying with a normal crew (as captain or second pilot) W/C Cruickshanks got together a “scratch” crew consisting of a number of experienced aircrew; W/C G L Cruickshanks DFC (captain) S/L W Davies (possibly second pilot) aged 44); Flt Lt Keith Falconer DFC (navigator 33); Fg Off Bill Esplen (W/op) (33); and Sgts L T Chapman (27); and A N Page (26) (air-gunners). All with the exception of Sgt Chapman were married and you will see that few were “youngsters” – (no age was given for Wg Cdr). The raid was claimed to be successful; although some crews failed to find Berlin. 15 aircrafts were lost including 5 Wellingtons. 214 lost only one. ; 214’s R1784 is reported “shot down” either by flak or night-fighters. All the six crew are buried together in the Berlin 1939-1945 War Cemetery. On rare occasions an aircrew could consist of a disproportionate number of officers high ranking or otherwise; and in the RAF; the man sitting in the left-hand (pilot’s) seat was the boss even if an NCO. I am not sure which was Bill’s regular crew or how many “ops" he had flown; but Keith Falconer had actually finished his tour and had no need to fly; but agreed on this one trip with his new CO. Keith was married to a “glamorous” film star and like Bill was a very popular figure. The outgoing CO (W/C Jordan) was greatly upset by the loss as Keith was always his own choice for navigator. 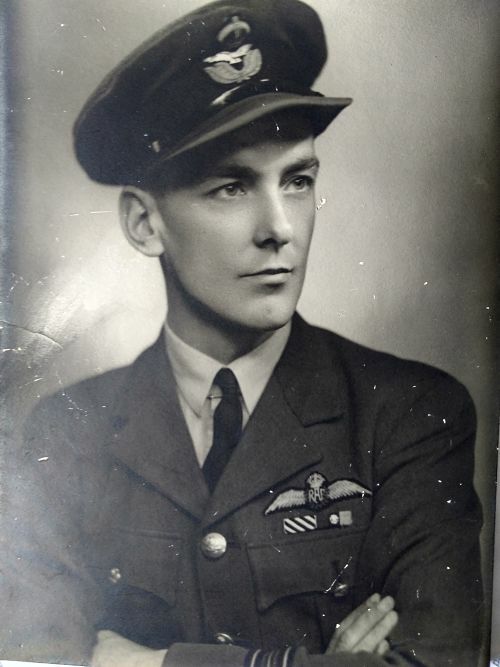 (W/C Jordan flew regularly) and he had arranged for Keith to join him as an instructor at the OTU at Bramcote. 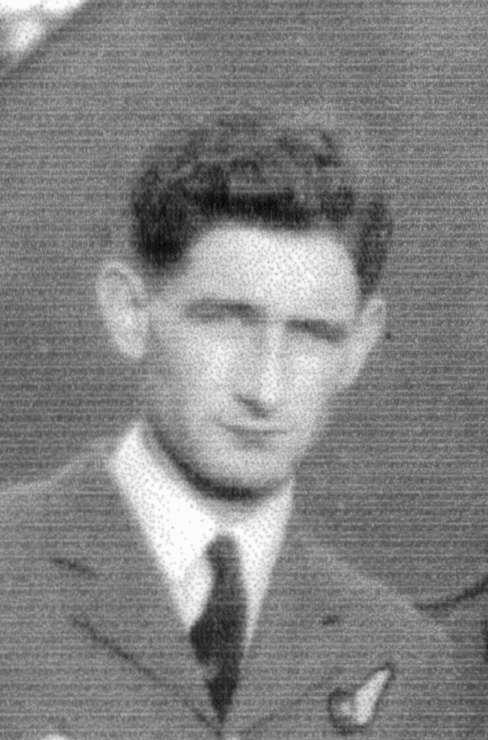 W/C Cruickshanks was replaced by W/C Barry McFadden DFC who himself was lost in February 1942 on operations but flying with a regular crew. The two photos above are somewhat of a mystery as to the location and the exact nature of the event. Simon, Bill's grandson explains: The small boy on the left is my father. Standing next to him with his hands on his hips is my grandfather. My grandmother recalled that this was a sports day held to mark the occasion of an officer who had recently been decorated. That officer is second from the left talking to my grandfather. Godfrey Moffatt has supplied me with a photocopy of a photo previously which related to a sports day and indeed my grandmother also had a copy of that photo. (other above) I suspect this is the same event. He advised me that one of the people in that photo was Percy “Picks” Picard of “Target for Tonight”. It may be possible that in fact it was Picard in whose honour the sports day was held. 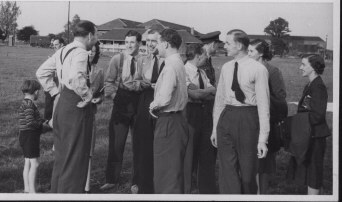 In the group of four photo, Godfrey Moffatt has advised that the gentleman on the left is Picard and the person directly opposite him on the right hand side is Wing Commander Cruickshanks who in fact was captain of the plane in which my grandfather died. The following crew photographs are of exceptional quality as found in officially sanctioned photographs. While many of the crew are the same in both photos, none have been identified except F/O Esplen who is far right in above photo and third from left in bottom photo. 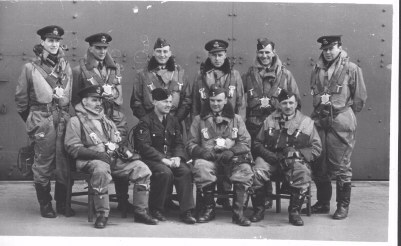 Flt/Lt Keith James Falconer is third from the right on the back row in the top photograph. Note in the top photo some sort of steel structure with graphitti on it was used as the backdrop. 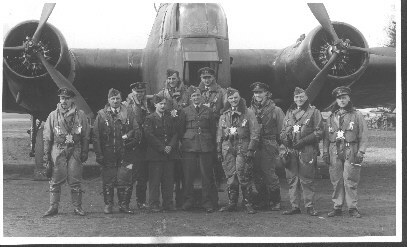 In the photo below the group is posing in front of what appears to be an Armstrong Whitley Whitworth, such being the case this photo may not be of a 214 group. It is thought 138 squadron were stationed at Stradishall at the same time and they flew Whitleys. As per the wheel chock, the serial of this aircraft starts out K34????? Note also the men who are not suited up in both photos which is rather odd, it is also unknown why the large groups of 10 and 11 men, this can not be a single crew in 1941. If anyone can identify any of those in the photos, please contact Simon or the 214 Site. Also see closeups of these photos in the PHOTO ALBUM section. Simon's grandmother had two very interesting newsclippings which can also be seen in the PHOTO ALBUM section. Named on the following Memorial : RUNNYMEDE MEMORIAL Panel 124. Son of Auguste and Rosetta Etienne, of Castries, St. Lucia, West Indies. After completing operational training, Hargest, Evans and George Steven who had become good friends, narrowly escaped fate when they were posted to a squadron based in Newmarket - the horse racing track. The day before they arrived the squadron had lost six of their eight planes (shot down) and all six crews perished. Since there were no aircraft left the three were then posted on to 214 Sqdn at Stradishall and operations. 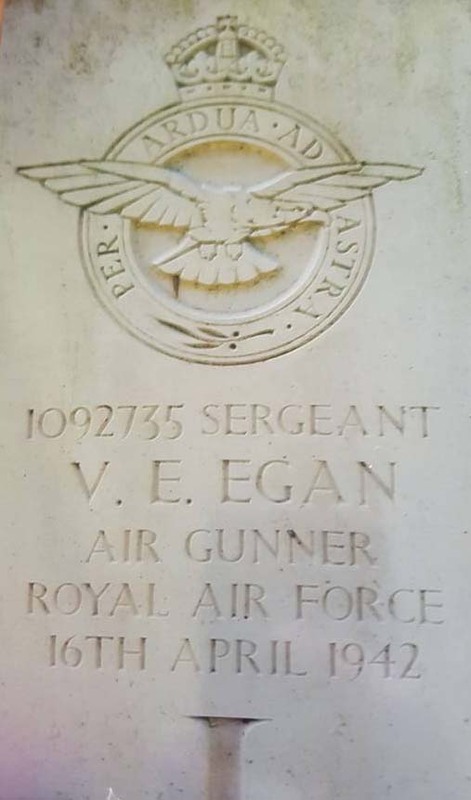 Sergeant Evans was rear gunner in Flying Officer John Leighton Beck's crew and in Pilot Officer Maurice Hartford's crew in 214 Squadron in the second half of 1940. When the rest of his crew was posted to Malta, he chose to remain in England although George Steven (the crew's other gunner) thought Evans was later posted to the Far East. Son of William John and Margaret Alice Evans, of Rhyl, Flintshire. Flew Tiger Moth, Anson, Wellington, Liberator aircraft. 'I have recently come into possession of my fathers flying log book. section, but with no information attached to his name. His service number was 101510. Full name Adrian Hugh Evans. Looking at the number of times he flew with these other pilots he must have formed a close attachment to them all. I would be happy for my email contact to be given to any surviving relatives. After his tour of duty, my father went to Lossiemouth to train other pilots and later in 1942 joined 160 Squadron for his second tour in the Middle East. Named on the following Memorial : Runnymede Memorial Panel 149. Son of Alfred Ethelbert Evans and Minnie Evans, of Richlea, Saskatchewan, Canada. 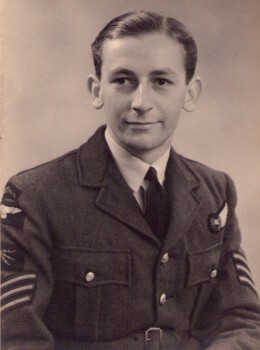 Sgt Ronald Frank Evans , Flight Engineer, 635327, Royal Air Force , Nationality : United Kingdom. 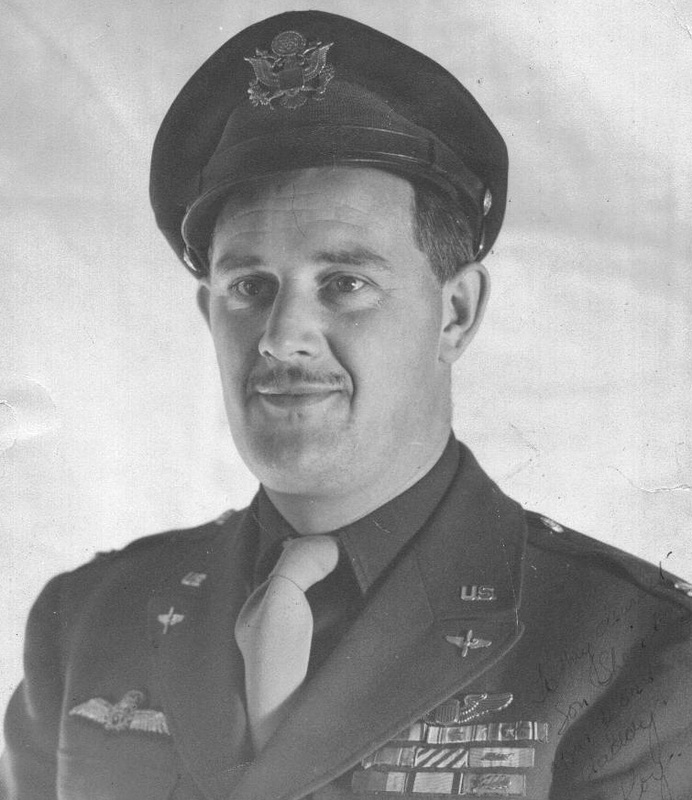 KIA 03 February 1943. He is buried at AMERSFOORT (OUD LEUSDEN) GENERAL CEMETERY. Plot 13. Row 5. Grave 81. Buried in FLUSHING (VLISSINGEN) NORTHERN CEMETERY. Reference : Row B. Grave 22. Son of William C. and Nellie B. Everett, of Glasgow. 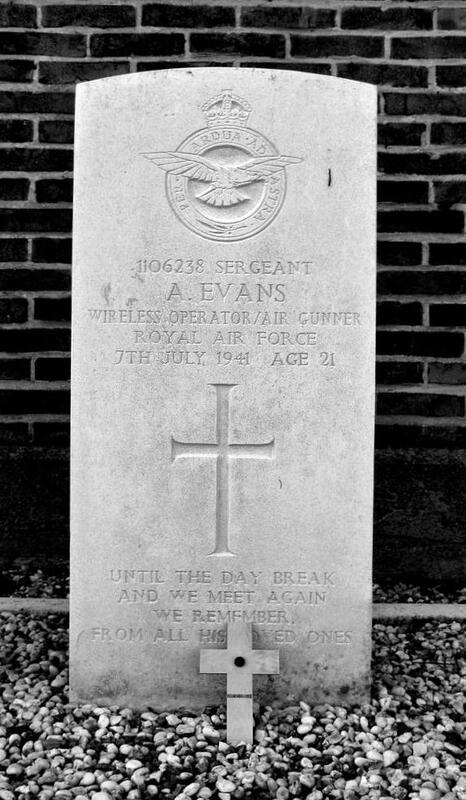 CWGC states death date 3 days after loss of aircraft?